Better customization. 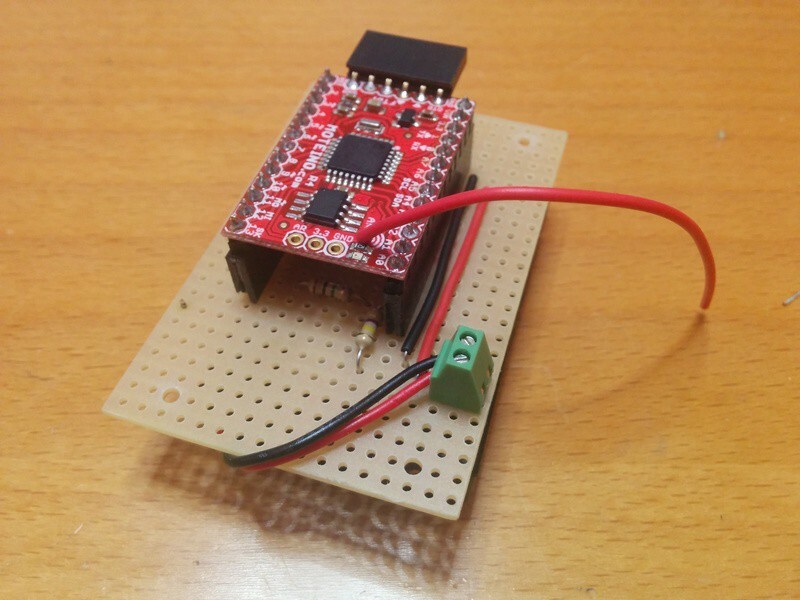 XBees are programmable, but really, who does that? 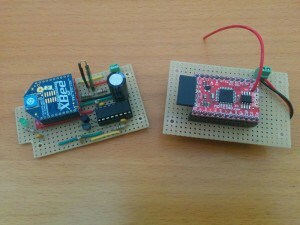 So here you have a good-old Arduino with enough processing power to use almost any sensor out there. Longer battery life. 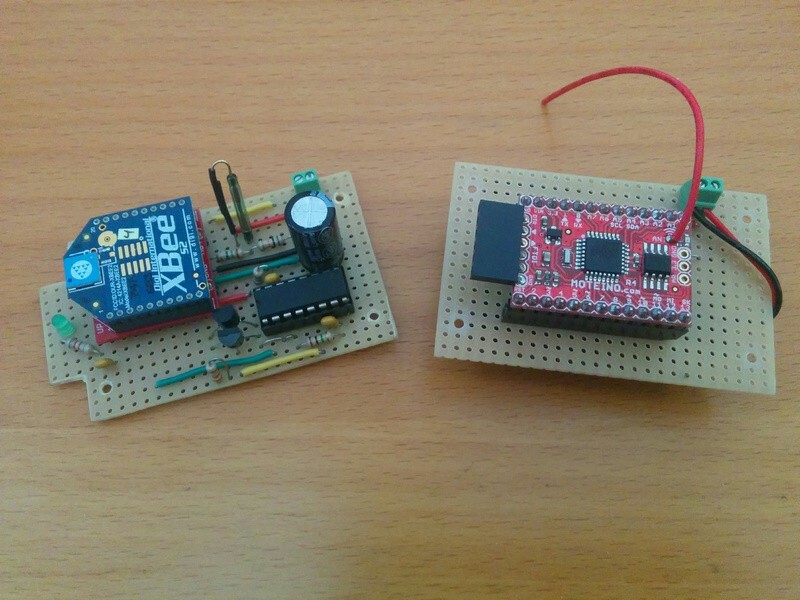 You have more options from code, like putting the radio, the flash chip and the microcontroller itself to sleep. 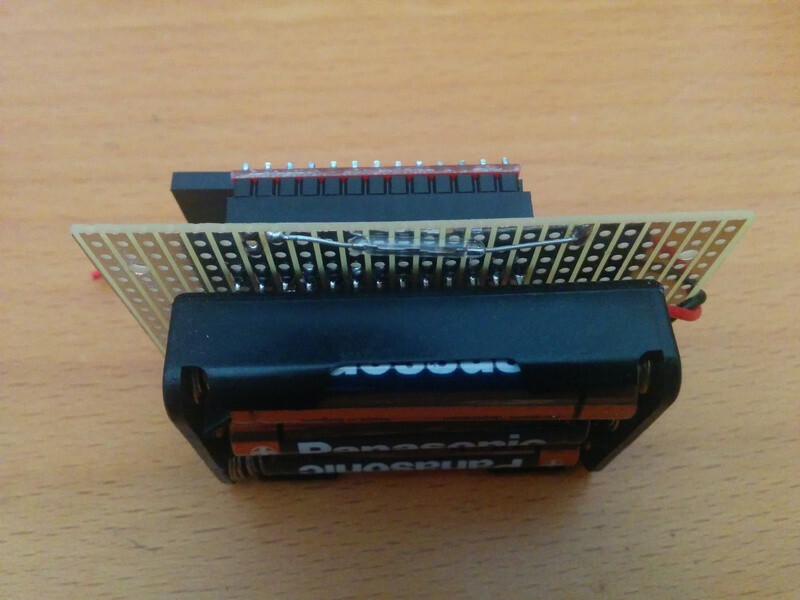 Besides I wanted to include a beefier battery solution, like 3-AAA batteries with >1000mAh. Easier to use. I had my share of the X-CTU software over Wine. There are a few things to note hardware-wise. First the battery monitor has been designed after John k2ox post in the LowPowerLab forum. The voltage divider consists on a 470k and a 1M resistors. 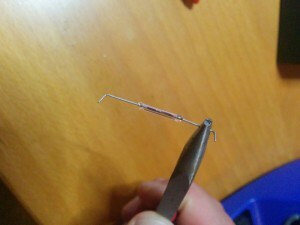 The downstream resistor is not tied to GND but to digital pin 12. When this pin is in high impedance mode the circuitry is disabled and no power is wasted. To measure voltage you first have to set it to OUTPUT and then LOW, do an analogRead in A1 and put D12 back to INPUT. Second the pullup resistor in the reed switch was a late addition to check weather there was a drop in power consumption compared to the internal pullup. But there wasn’t. I’m a bit surprised by this fact but I couldn’t get a different result. To see how I did the measurement look for the Power section below. 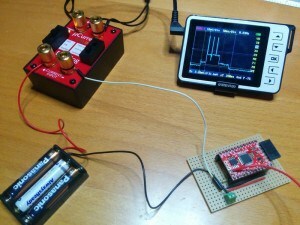 The code is quite simple, it relies on Felix Rusu and Thomas Studwell RFM69_ATC and RocketScream Low-Power libraries. 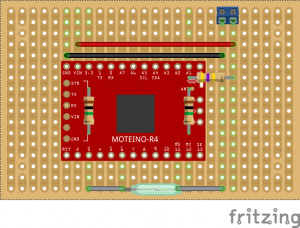 The reed switch is tied to an interrupt pin that awakes the Moteino whenever it changes it’s state. Then the code debounces the signal and checks if the value has changed. I started with a 25ms debounce time and later I checked with my DSO Nano that 5ms is more than enough. Signal and messaging looks a lot more reliable than with the XBee, where I had bounces and ghost signals (a door open and closed trigger two messages and seconds after, two more messages). The status variable holds the last status sent and acknowledged by the gateway. So if we are missing an ACK the code will try to send the same message again in four seconds. You can check the full code at my Door Monitor repository on Bitbucket. Like in “BAT:4302:34”. The packet ID is optional but my RFM69GW uses it to check for duplicates or missing packages. It can be disabled changing the SEND_PACKET_ID value in RFM69Manager.h to 0. Power is key in this project since the sensor will be battery operated. In the first generation, with the XBee, it could work for about 3 months on a single ~300mAh CR2032 coin cell. For this second generations I wanted both more autonomy and reliability. Reliability often is a trade of with power consumption: more checks, more messages, more time awaken. 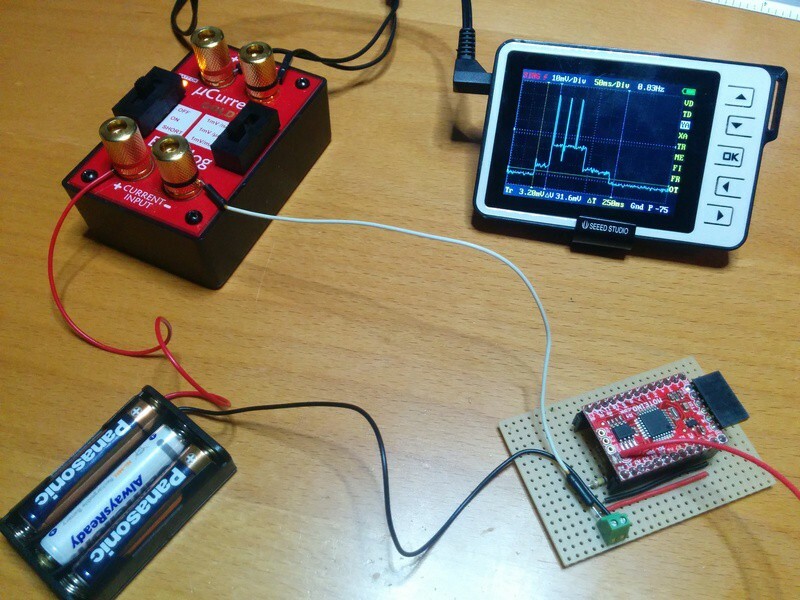 I own a poor guy’s DSO Nano oscilloscope that is good enough for a poor engineer like me, and I recently bought a uCurrent Gold from EEVblog and this is the perfect project to test it! First some static values using the multimeter. 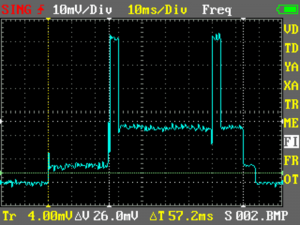 The uCurrent was set to 1mV/1mA for all the values except the last one, that required the next level of precision: 1mA/1uA. This last value is roughly twice the minimum in the Moteino specifications… don’t know why. You can easily spot the DEBOUNCE_INTERVAL (#2) and the NOTIFICATION_INTERVAL (#5) in the graphic. I later changed the DEBOUNCE_INTERVAL to 5ms so #2 is 5 times shorter. 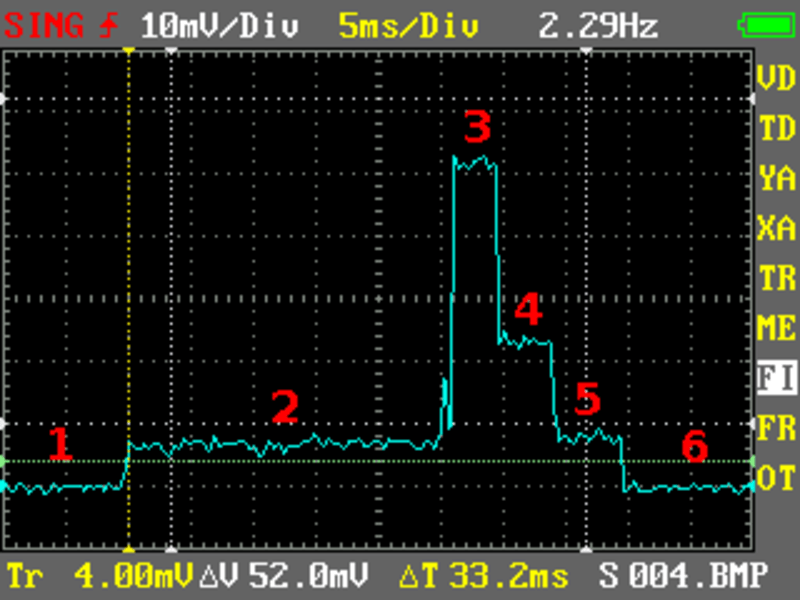 Also radio pulses (#3) vary depending on the transmitting power. Since Auto Transmission Control is enabled the radio will modify the transmitting power to match the given target (RSSI -70) so first bursts will use more power and it will eventually go down to a stable lower value. 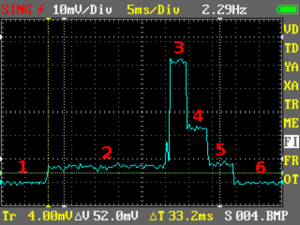 I have seen burst at -60 RSSI that used less power than the radio waiting for the ACK (is that even possible?). Know more about Auto Transmission Control in this post by Felix Rusu. Normally the sender will receive an ACK in a few milliseconds (#4) and will go back to sleep. But if the gateway is too busy or the ACK gets lost the sender will retry after 40ms up to 2 more times. So the total time with the radio awaken can be 120ms + 3*4ms for each radio burst. But this rarely happens. Two spikes 40ms apart. The gateway did not ACK on time and the node tried again. Note that the debounce time only applies if there has been an interrupt caused by the reed switch. At home that could happen like 20 times a day. But the non-interrupt message, the heartbeat the sensor sends every minute does not have this leading time (check code above). So the normal operation would be: a heartbeat without debounce time, one single spike with a quick ACK form the gateway (averaging 4-5ms) and a nice LED blinking for 5ms at the end (off course I could get rid of this but it’s good to have some kind of visual notification). 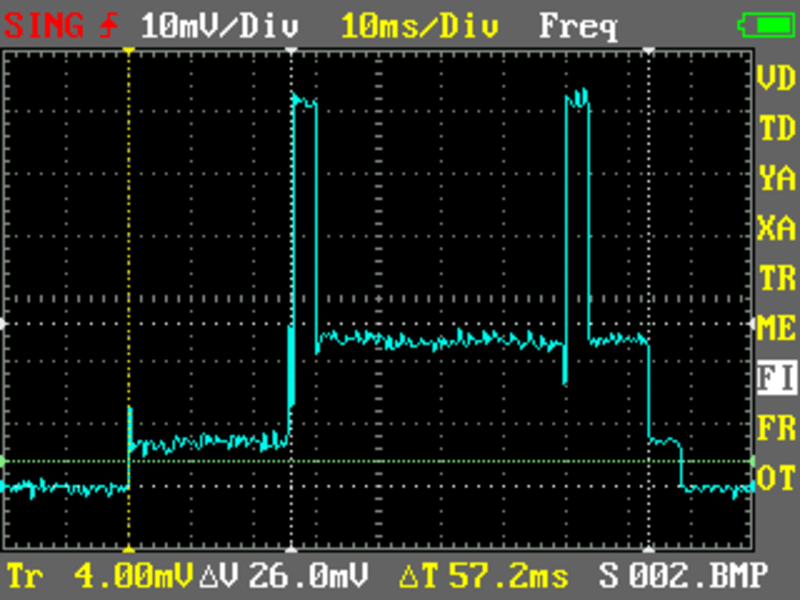 This averages to 22uA (1309mA*ms/minute / 60000 ms/minute). A 1000mAh battery would last almost 46000 hours or more than 5 years!! These calculations are assuming high power messages, 1 battery message every 10 status messages (hence the 1.1 events per minute), no interrupts (like if the whole family was on holidays) and perfect communication with the gateway (i.e. quick ACKs). Door events would add little to this and right now the gateway is responding 99% of the times within the first milliseconds… that off course could change as it has more messages to process. On the other side ATC will even improve these numbers. Time will tell. Right now numbers on paper (or blog) look gorgeous. Let’s see what numbers do real life. 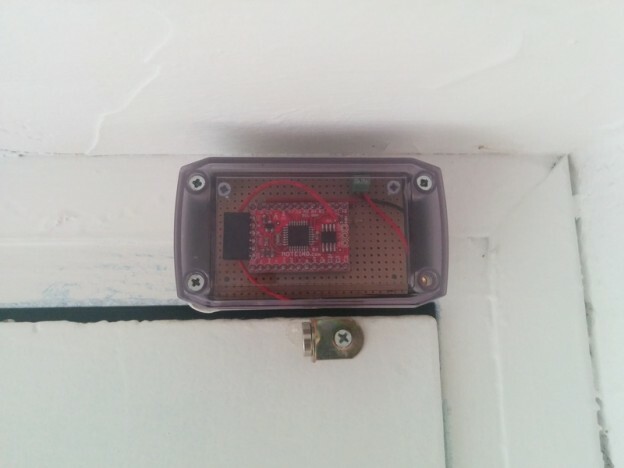 Code and schematics for this project are released as free open software and hardware and can be checked out at my Door Monitor repository on Bitbucket. 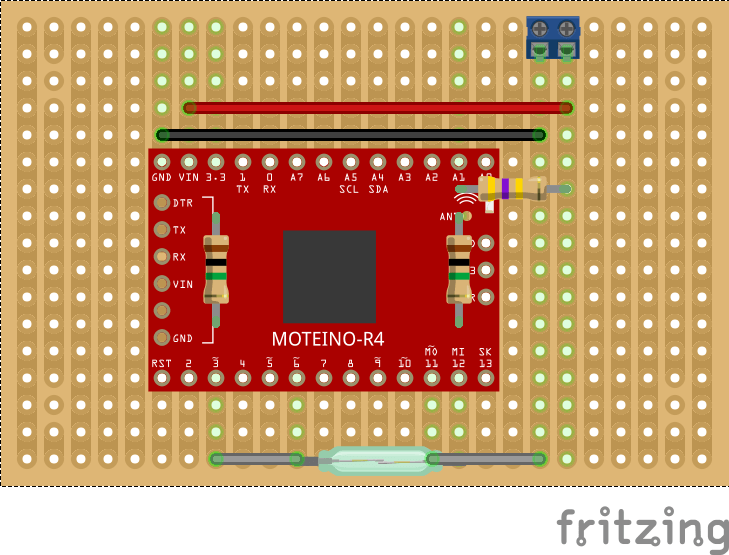 Moteino Door Monitor by Tinkerman is licensed under a Creative Commons Attribution-ShareAlike 4.0 International License. could you please add an option to get email alerts on a new blog post. i know wordpress has that addon. the “notify me of new comments via email” does not work. Thanks for your suggestion. I will give it a look. Anyway I recommend you to use a news reader to get updated of your favourite blogs. I’ll also check the main notification on new comments.